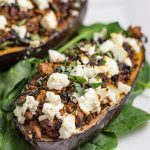 Keto Lamb Stuffed Eggplant - "Quick & Meaty"
This delicious Keto Lamb Stuffed Eggplant recipe is inspired by Middle Eastern flavors. It’s a great all-in-one meal that can be enjoyed alone or with a side of cauliflower rice. Slice the eggplants in half lengthways and cut a 1cm wide border around the edge of each eggplant. Scoop out the centers, dice and set aside. Place the eggplant shells on a cookie sheet and set aside. Put a large non-stick frying pan over high heat. Add the oil, onion, and garlic and saute until the onion starts to turn translucent, then add the lamb. Saute the lamb, breaking it up, until browned. Add the salt, pepper, and spices, along with the diced eggplant. Cook for 5 minutes before adding the passata. Simmer for 10 minutes then remove from the heat. Stir through the spinach and allow to wilt. Spoon the lamb mixture between the eggplant shells the place in the oven to bake for 15 minutes. Top with the feta cheese then bake for another 8-12 minutes.